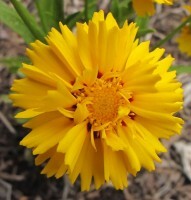 Compact upright habit, very floriferous with semi-double bright yellow flowers. Height 30cm. Full Sun. Sow indoors from February in moist seed mix compost in small pots. Germination takes around 14-21days. Can also be direct sown into prepared seed beed after last frosts. Propagation: Needs light to germinate-annual sow direct. Can divide in the spring or autumn. May also be grown as an annual. Soil conditions: sandy or dry, clay soil. It likes fertile to average, well drained or sandy soil. Interest and use: Cutting bed; long-flowering. border Summer/Autumn interest.